﻿ Victorian Perambulator Museum & Art Gallery - Ohio. Find It Here. 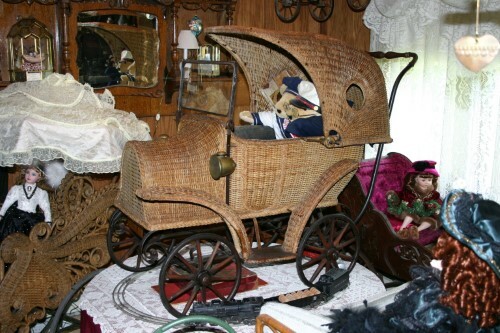 The Victorian Perambulator Museum & Art Gallery is the only one of its kind in the world, featuring displays of over 250 early wicker baby and doll carriages. These wonderful works of art are handmade from natural fibers and fashioned into intricate, ornate designs. Amongst the perambulators you will also find displays of children's sleds, dolls, velocipedes, farm wagons, toys, books, games, carousels, doll houses, and much more including Queen Elizabeth's carriage!